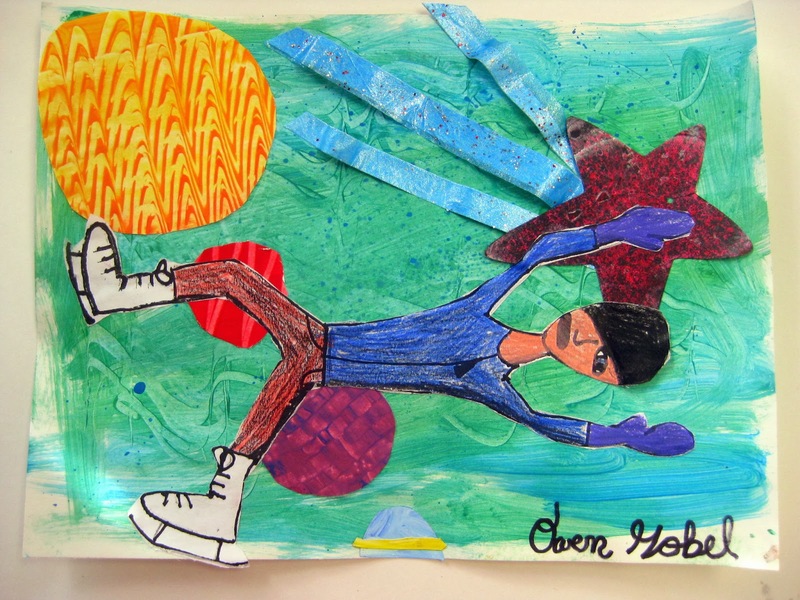 In the Art Room: A Guest Post While I'm Away! Hey guys! Just back from the NAEA conference in San Diego...and attempting to recover from that awesome experience! I'll be back with you soon with plenty of photos and stories from this past weekend but until then, please enjoy this post written by fellow art teacher buddy Faigie! I am so thrilled to be filling in for Cassie while she has a great time in San Diego. I like to bill myself as the art teacher with no art background. I do have a Masters in Early Childhood Education and have always been extremely involved in the progressive art part of early ed, and have even given workshops to teach teachers how to incorporate good art into their classrooms. It was only this year however, that I became a bona fide art teacher, teaching in a new private school that only goes up to first grade so far. 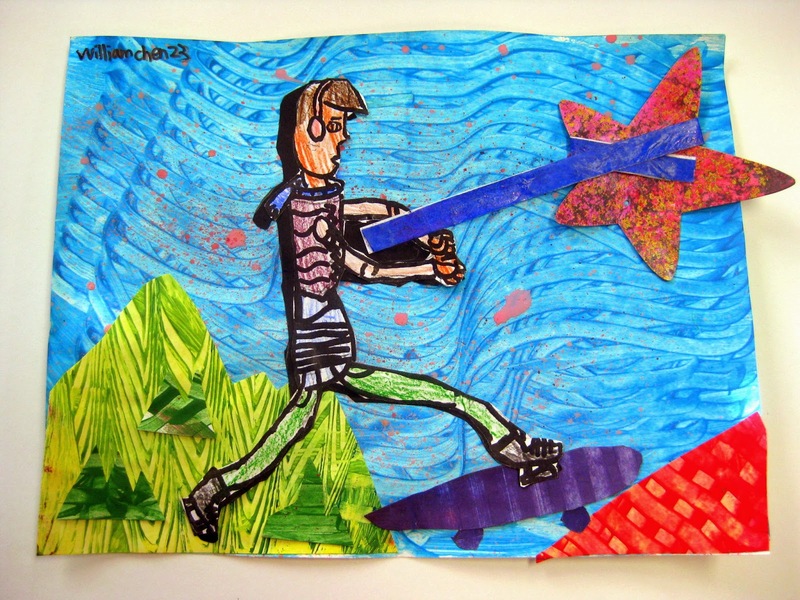 Even though I have a passion for kids and their art, I've always particularly loved collage. 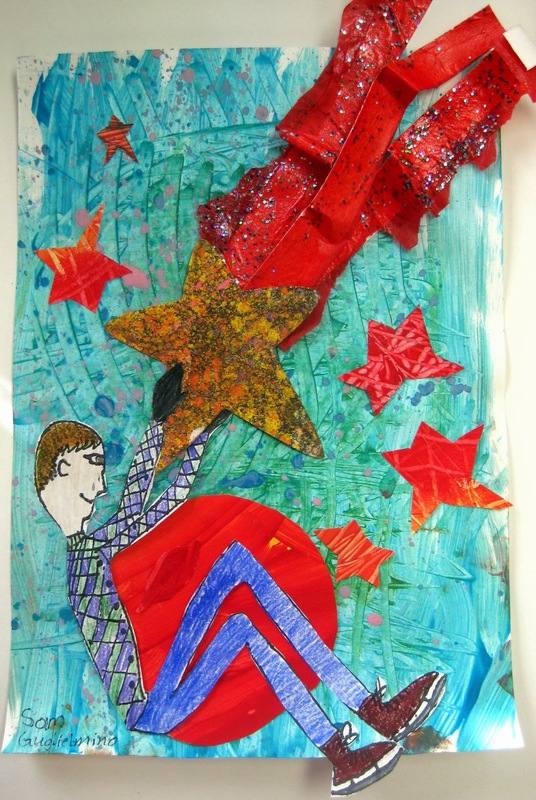 I really see how with a little bit of direction and some suggestive materials collage brings out the best of children's creativity. This year I only have the first grade and Kindergarten and usually try to do different activities with them. For this activity however, I decided to give both of them collage. For the first grade I added a bit of a twist. I cut out some basic shapes using the large shaped hole punchers to get nice round circles. I also decided to add some hexagons for interest. When the children came in I sat them down and held up each shape individually. 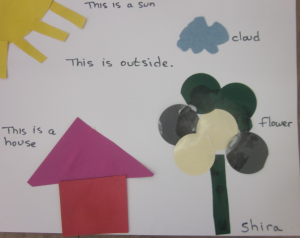 We discussed what each of those shapes made them think of. I wanted them to go to the table thinking and to create "something", not just a design. It's obvious from their work that they really did try to use their pieces as part of a larger picture. I also added their own descriptions of their pictures to their artwork which I find really adds dimension. 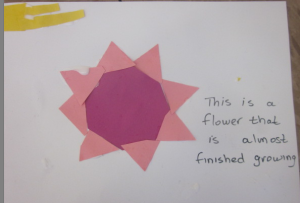 Some of course made one larger picture while others made a few smaller objects on their papers. Then came the first graders. When they came in I went through the same discussion that I had had with the Kindergarteners but, I added one thing. 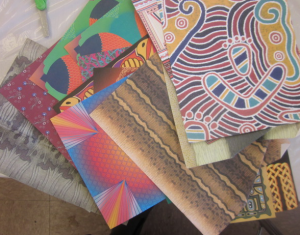 I had found a bunch of patterned papers that I had with my art stuff and I told them that they had to pick out a piece of a pattern from one of the papers and incorporate it into their collages. 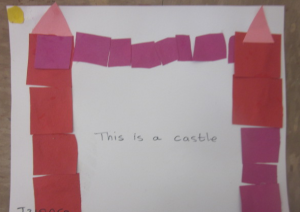 I found that many of the children got their ideas from their pieces they cut out and built on their artwork from there (which was the idea). The one below was a squirrel trying to get an acorn from a tree. 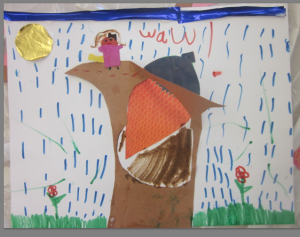 In this one, the little girl wrote her own description of what was going on in her picture. 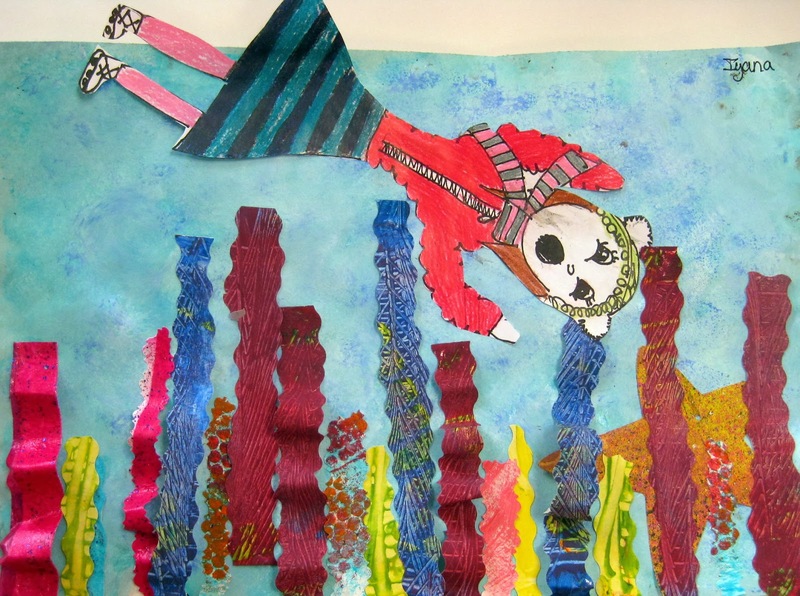 One of the things I love so much about collage is that there is so much variety that can be added to each collage activity that only allows for more and more creativity. There are also many levels of sophistication in many of them and I know this can be done with all ages. I can never compete with Cassie's wardrobe and I don't intend to. HOWEVER, I didn't think it would be nice to finish off a post on her blog without showing you a picture of what THIS art teacher wore (or wears). 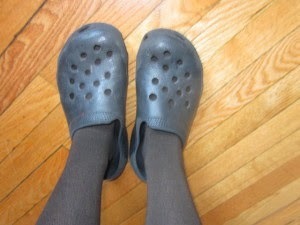 So here is my picture below of what I wear (or change into) in EVERY art class. Faigie Kobre is a new art teacher in a fledgling private school . She also gives art classes in her home. 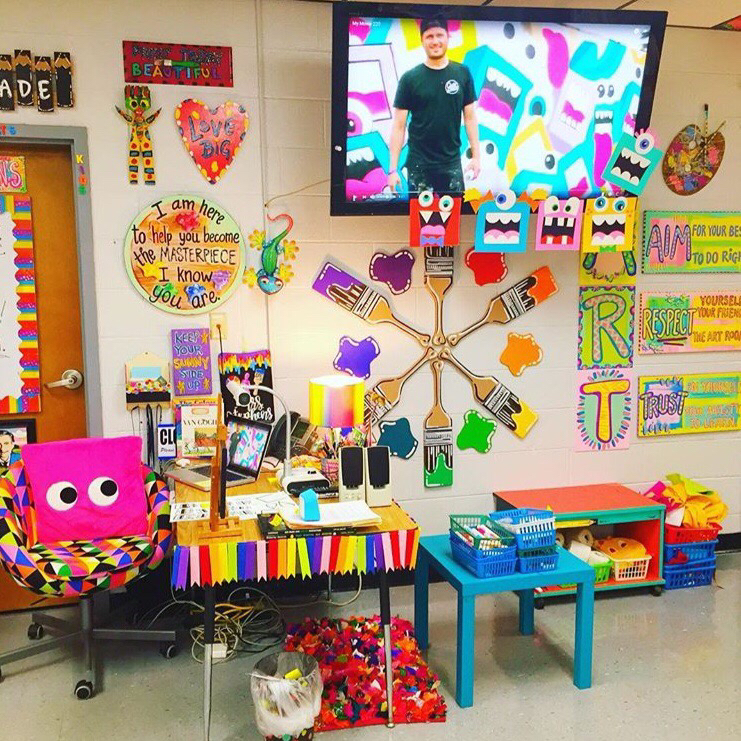 She runs a blog called EduArt 4 Kids teaching parents and teachers how to give their kids great art that will help them think. 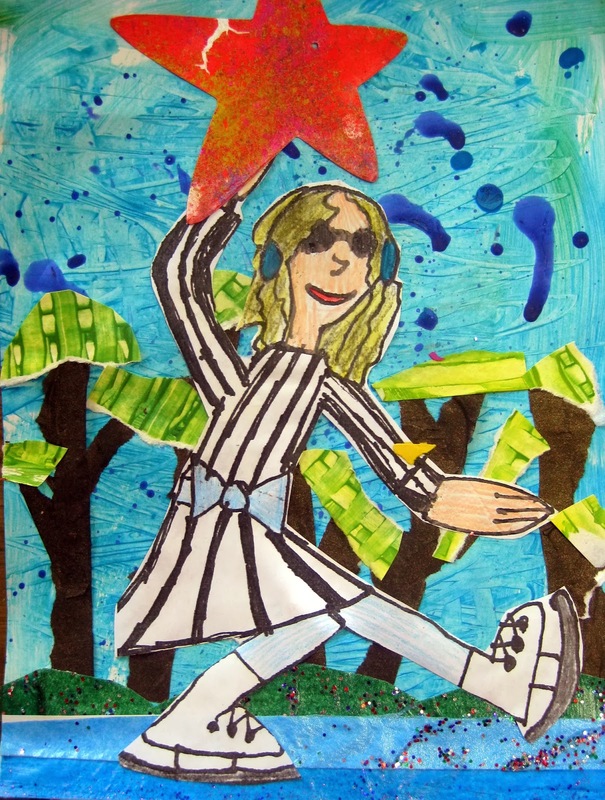 She believes that everyone can and should do art. She has a FREE report that you can get now called "The REAL reason most people can't draw a straight line, plus 5 tips to make sure your child will". 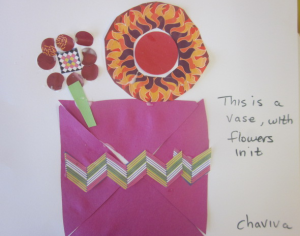 Even if you are a real artist, a distinction that she does not claim to have, you will find it interesting and may even help you help the parents of your students. Have you ever done one of those projects where you just knew it was gonna be quick -n- easy, everyone was gonna be successful -n- happy, finish at exactly the same time -n- be ready to move on to that Next Big Thing? Take this "quick -n- easy" figure drawing experience. 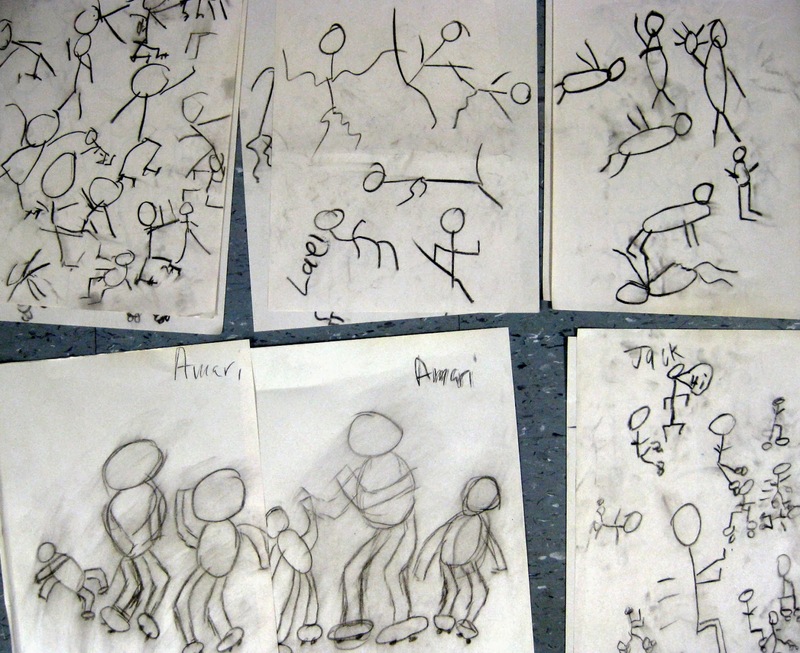 My fourth grade created gesture drawings of their classmates roller skating in P.E. The intent was for them to use those drawings as inspiration for a figure drawing of an ice skater. 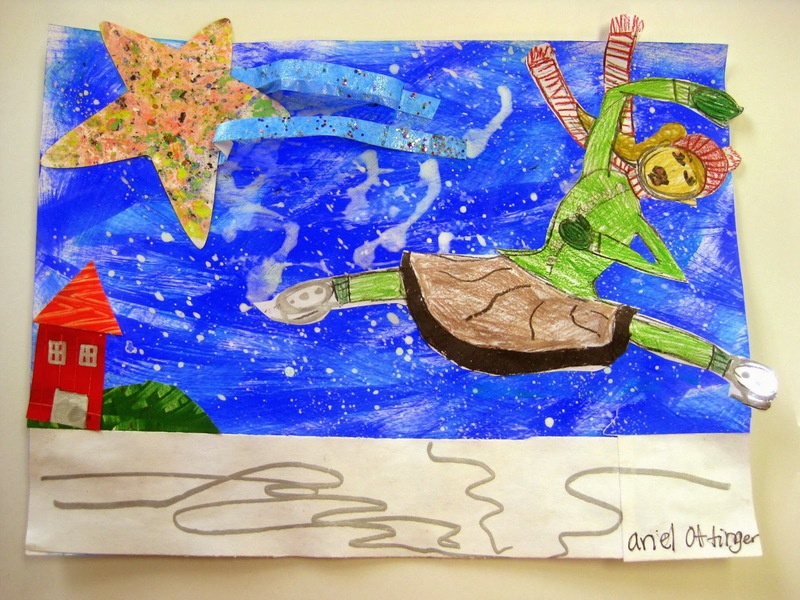 That ice skater will eventually be added to a school-wide mural (I'll keep ya posted). 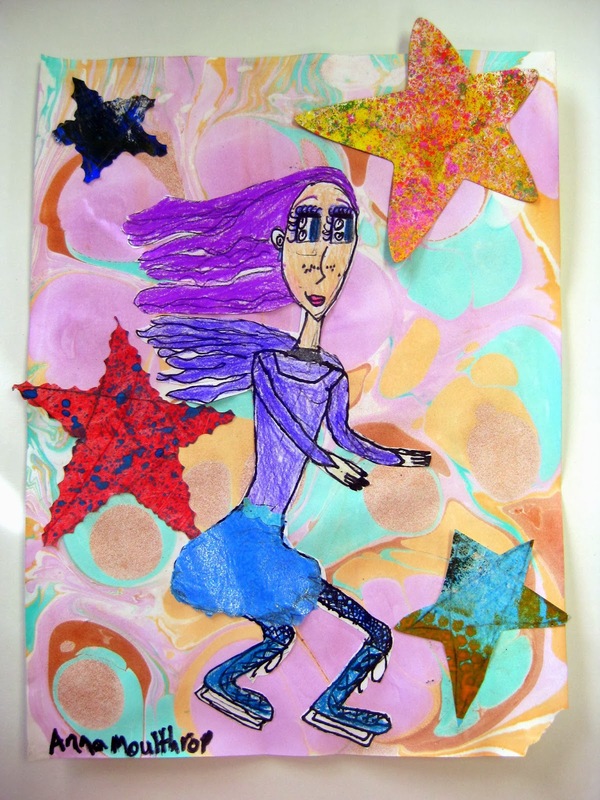 Have you ever taught figure drawing to the under-10 set? It's, like, seriously tough, ya'll. This artist told me her figure is diving for a starfish. AND it took them For-Eve-Errr. Like three separate thirty minute classes. If you're good at math you know that's an hour and a half, people! Granted, their results were pretty rad and they were pleased as punch with themselves. However, I wasn't about to let their drawings just get glued to some mural. So I made enlarged photocopies of each drawing, passed 'em back to the kids along with their chalk stars and asked them to create a narrative using the two. But I'm getting ahead of myself. Let's go back to that gesture drawing bit. Gesture Drawing: If you've not tried this with your kids, you really outta give it a go. My students loved it. We spent about 5ish minutes in the art room chatting about gesture drawings just being quick and simple sketches that are meant to capture movement. 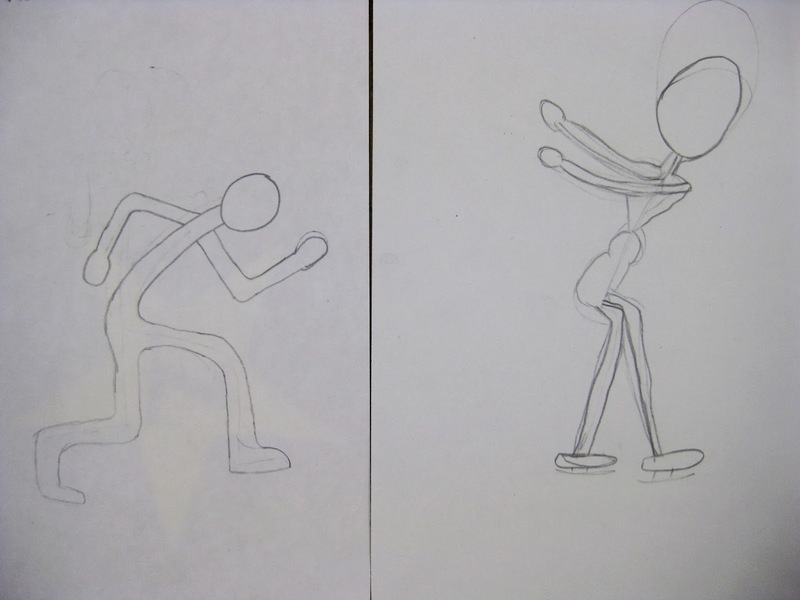 I demonstrated a quick drawing of a student running in place. We all agreed my drawing looked terrible by normal standards...but had I captured movement? Yep. We also had a quick chat about how we were visitors to the P.E. room and we were to work quietly and stay outta the way of the skaters. Then we gathered up clipboards, newsprint, charcoal sticks (which they loved) and cloth erasers and spent about 15 minutes drawing as many skaters as we could. I love their finished results. They are all so different in their style. I really love how so many of them look like Keith Haring people...which gave me all sorts of ideas for future projects. Gesture drawing was all fun and games until we returned to art class the following day. 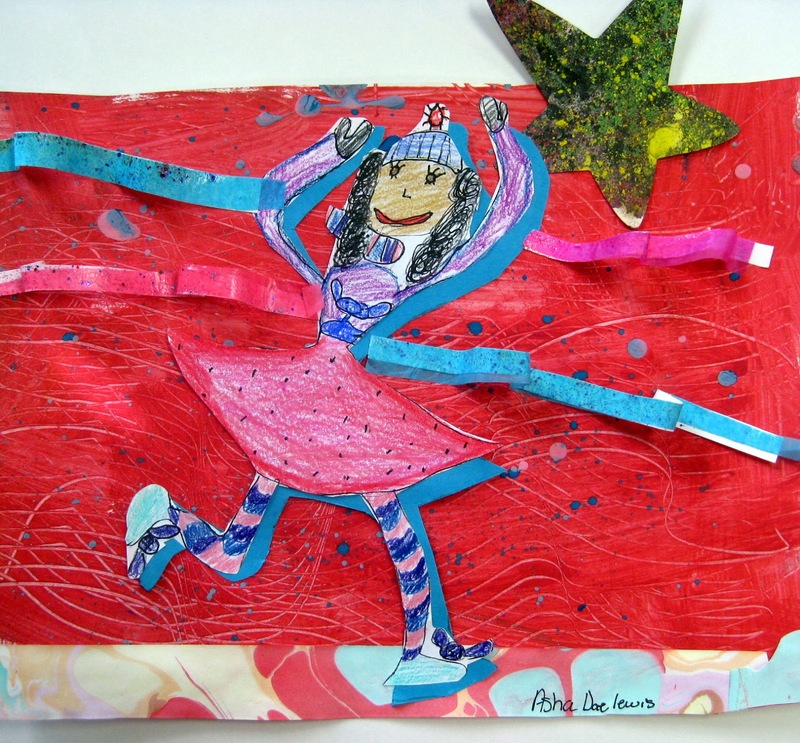 I told the kids that we were going to be creating ice skaters for a school-wide mural. With their gesture drawings in hand, the kids were to pick their favorite, use a wooden mannequin to model the same pose and draw from there. Which worked for some. Others were still stumped. For those kids, we regrouped and I broke it down a little more: turn your stick man into a thick man by adding lines on either side of the stick drawing. The drawing on the right shows someone who made their "stick man into a thick man" while the artist on the right used a mannequin. We struggled with proportions and just how the body works...but in the end, I was pleased if their peeps simply showed some sort of movement. And had a head. From there the kids were to add clothing to their figures and trace with a thin sharpie. It was at this point that I decided to make enlarged photocopies of their drawings...I just knew we'd come up with another project for them. So, after coloring and cutting out both of their people (small original and enlarged photocopy), I challenged the kids to create a narrative collage. And they were like: A-Whah-Huh? So I busted out some Marc Chagall and we talked about how artists often tell stories with their art. We chatted about Chagall's work and some stories that might be behind them. 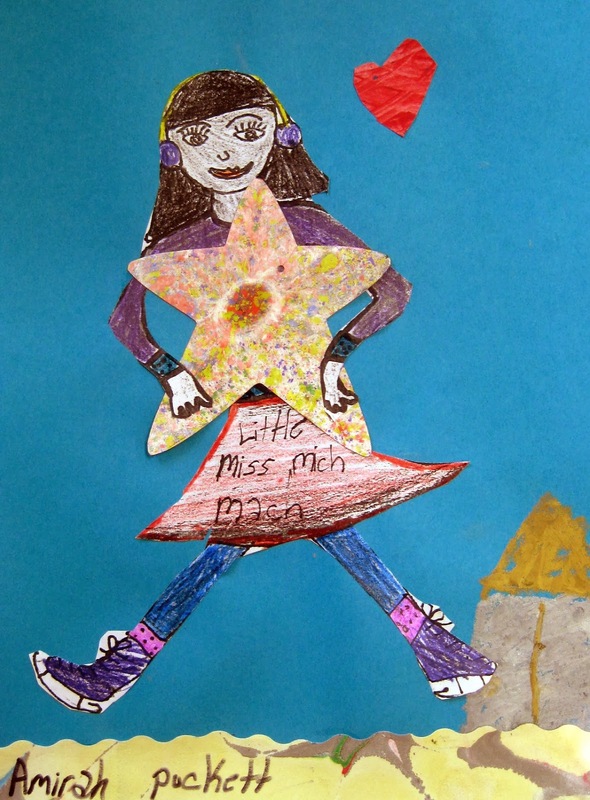 Then I told 'em that they were to create a narrative tale with two subjects: their figure drawing and their chalk star. 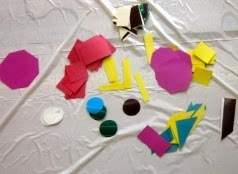 At our supply gathering area, I laid out tons of painted, marbled and sparkly papers along with boxes of scraps. I told the kids that they were to come up with a story that they had to present to me before they glued it down. I did this because I really wanted them to cut out shapes, move their papers around and really think about their story instead of just cutting and pasting. After presenting their idea to me, we'd talk about whether or not their collage really told their story or not. For some, that meant adding a background to set the scene. 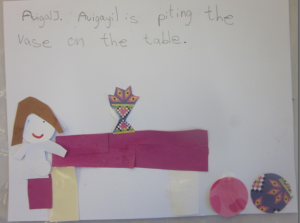 Often, they were sent back to their seats to continue working on the visual details of their story. There was some grumbling and some "but it's finished!" to which I usually replied "Nah. Make it even more awesome." 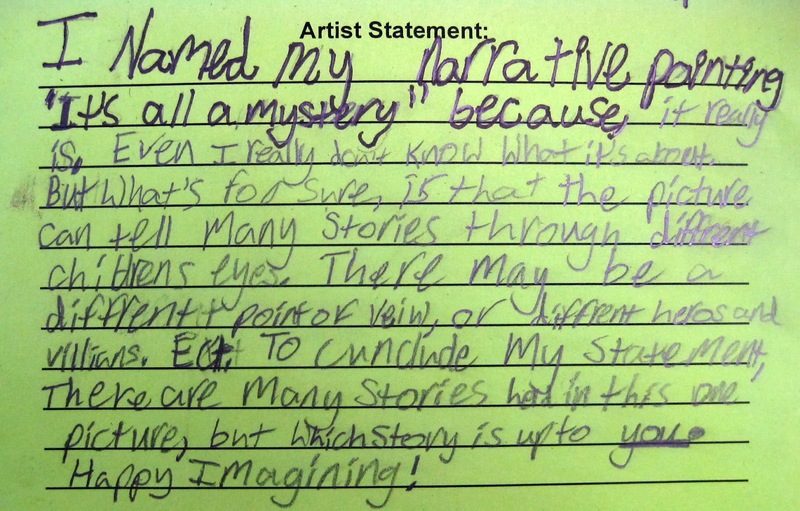 Once finished, I asked the students to write up an artist statement to accompany their piece. 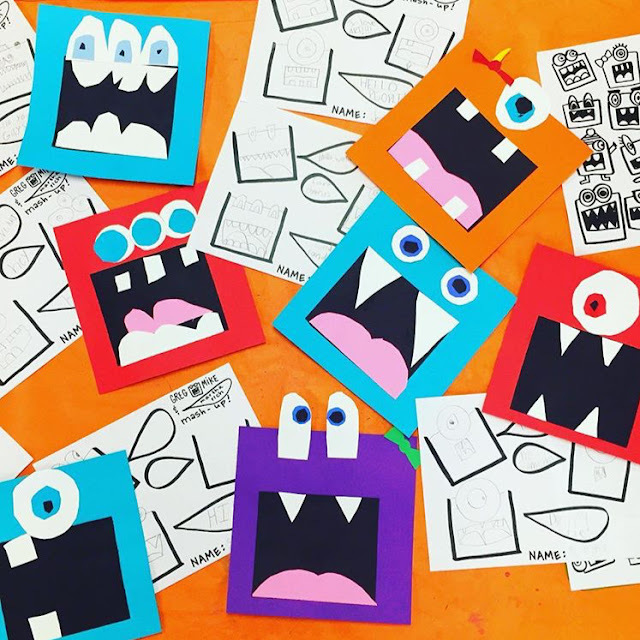 We talked about how an artist statement could either reveal the entire story behind the work...but how most artists like the viewer to create their own tale. Have ya'll taught figure drawing before? Do you have a sure-fire method? I know if I teach this again there will be some mucho tweaking. So I'd love your input.